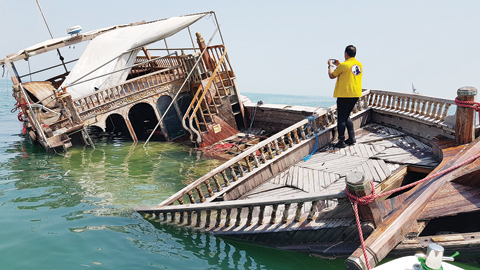 KUWAIT: Professional Kuwaiti divers, aided by volunteers and advocates of environment protection, lifted a 25-meter-long, sunken wooden ship from south of Kuwait Bay. The chief of the diving team, Waleed Al-Fadhel, told KUNA yesterday that the team used air bags and water pumps to float the ship to the water’s surface and later would be towing it to Doha coast for maintenance works and to ensure the future safety of sea-goers of Kuwait Bay. The ship was considered a threat due to the dispersal of some of its parts in the sea during high tide. So it needed to be removed in order to ensure the safety of sea-goers in addition to containing fuel and oils which could adversely affect the marine environment, he added. He explained that the recovered ship is locally called a ‘Baghlah’. ‘Baghlahs’ were traditional Kuwaiti sailing vessels which were used for travel from Kuwait to India and East Africa as well as Aden and Basra, indicating that this ship is extremely rare as only three vessels of this type were ever manufactured in the Gulf.